Discounted zombies! Affordable bookworms! Cheap jewels! PopCap's having a sale! It's that time of year when gamers are treated to massive Holiday sales. While Steam has some pretty epic deals going on, this isn't the only place to find some great games at some rock-bottom prices. 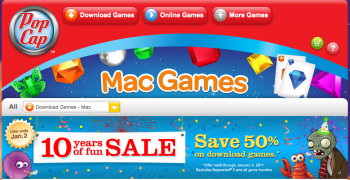 Case in point: PopCap has discounted nearly its entire catalog (not just Mac games, like this screenshot might imply). For the next few days, up until January 2nd, the publisher has announced that it's cutting its prices in half for most of its games. While most of the games are on sale, neither Bejewled 3 nor game bundles are being discounted. Still, that means titles like Plants vs. Zombies, Feeding Frenzy, and Zuma are pretty affordable for even the most Scrooge-like gamer.